This was the first new church in the southern part of Preston, after Brighton began to expand into it. In 1880 E E Scott and R S Hyde prepared plans and tenders were sought (B 39 p63), but the foundation stone was only laid in 1885, by when E E Scott’s partner was F T Cawthorn (A 34 p138). The latter was probably mainly responsible, for the design differs from Scott’s earlier work. The nave of flint with brick dressings was completed in 1886 and the chancel was consecrated in 1900 (CDK 1900 pt 2 p148). The cost is said to have been £6863 (KD 1899), though it is unclear whether this included the chancel. The east window had Perpendicular tracery with a transom; most others were lancets, except for two simple traceried west windows. The chancel faced the road, so this was the principal facade and a tower was intended to stand south of it, but never built. It was to have had a broach spire behind a parapet (BN 49, 21 Aug 1885 p xvii) and without it, the church was unimpressive outside. Like other churches around, it was on a slope with a hall under the west end. This was faced in stone not flint and was lit by triplets of lancets. The low, arcaded interior was dominated by the stone reredos (see below). 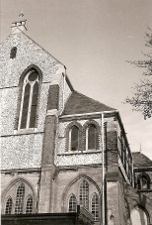 There were too many churches in this part of Brighton and in 1977 St Saviour’s was made redundant (CCC), before being demolished in 1983, to be replaced by flats. The reredos was moved one more time to another redundant church, All Saints, Portfield, Chichester (Dale p143). 1. (Former east window) Mayer and Co of Munich, 1889. This was moved to the church of St Augustine, Stanford Avenue after this absorbed the parish of St Saviour but it was later itself made redundant, though it is understood that the glass is still there. 2. (Former north aisle lancet) L Lee, 1953 (DSGW 1958). Reredos: Designed for Chichester cathedral in 1867 by R H Carpenter (B 64 p319) and carved by J Forsyth (BN 14 p827). It was absurdly over-sized for this church, to which it was moved in 1904.